Earlier this month, I received a special bilao from Lucky Me!. Our helper thought that it's palabok, and she was actually right. What I got was a bilao of Lucky Me! Special Instant Pancit Palabok which is one of the newest dry noodle products from Monde Nissin. Since my sister and I are fans of both Lucky Me! and palabok, we didn't waste a second and went straight to the kitchen to cook a few packs of the Instant Pancit Palabok. Each packet has a block of dehydrated rice noodles, a sachet of palabok sauce, and a pack of dried toppings. Preparation is super easy too as you only need to follow a few steps. Add boiling water to the dehydrated noodles, and cover for 4 minutes. Carefully drain the water from the noodles. Mix the noodles with the palabok sauce, and add the toppings. You can also add optional ingredients like slices of boiled egg. For about P12 to P14 a pack, Lucky Me! Special Instant Pancit Palabok is actually quite good for a light afternoon snack. The sauce was quite savory and the toppings added saltiness and texture to the noodles. However, I think the palabok sauce included in a pack of the Instant Pancit Palabok is bitin. Sure, it can coat the rice noodles nicely, but it isn't as flavorful as I would've wanted. I actually ended up using 2 sachets of the palabok sauce to make my Lucky Me! 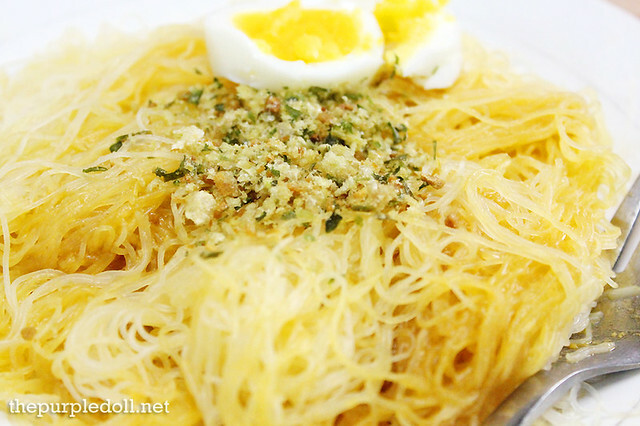 Special Instant Pancit Palabok tastier. Have you tried the new Lucky Me! Special Instant Pancit Palabok already? As for me, I think I'll give the new Curly Spaghetti Korean Style Spicy BibimMyun a taste too! I always go for Pancit Canton too! :D Actually, if Luck Me! 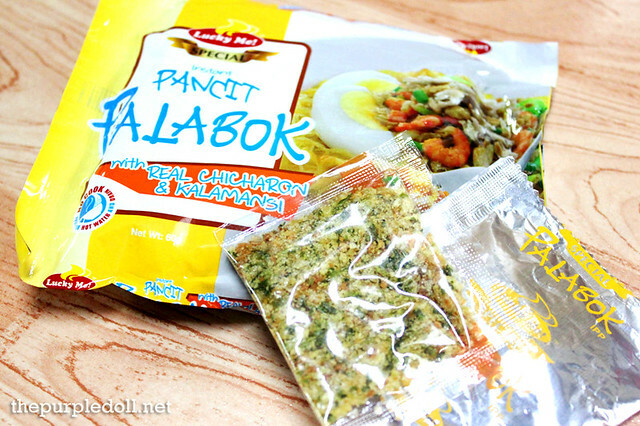 hasn't sent me these, I wouldn't know they have instant pancit palabok na pala! Have tried this before. Was very good, first ever instant palabok ive seen. My hubby loves palabok. I will buy this at the grocery soon. oh my, nag ccrave pa man din ako ng palabok!! I don't think anything can beat the real palabok. Sahog pa lang mahirap nang pantayan.. But yes, instant palabok is good for quick fix :D Mura pa! this post makes me drool and go to the nearest grocery and grab packs for me and my sisters. perfect with hot pandesal! My kids, specially me, would love this!!!! The Lucky Me! Pancit canton is always a favorite in the family so I'm really excited to try the new Lucky Me! Instant Palabok. I agree with you about the sauce. I always like my palabok with a lot of sauce, hope they would add more sauce to the pack. I haven't tried these yet but I'd like to try to. I don't eat so much of the instant stuff unless there's really nothing to eat here at home. But it's kind of expensive--I mean it's still cheap but expensive compared to its counterparts but we'll see if the flavor is worth it. I mean, switching to this from pancit canton. is this product available in the market? I saw this in the supermarket and grabbed one too! Super good! two thumbs up! Wow! it looks so good & so wasy to make. This will be a quick fix whenever I'm yearning for Pancit Palabok! this is a good option for me since i am renting a space here in alabang. budget friendly and yummy. I got a chance to taste this when Ayala Malls Cinemas gave them for free when you watch a movie. It was nice and I agree with you on the palabok sauce - BITIN! I hope Lucky Me recognizes this and will make some adjustments. im a big fan of palabok, kaya sinubukan ko agad to, sarap nya, un nga lang sobrang konti nya and a bit pricey, sana in the future magkaron ng bigger size nito! i already try this,. yummy,. its easy to cook kaya every time na ngrereview ako lagi akong mayroon nyan,. my kids love this,. wala png hassle iluto,. my wife & i like this,. I love palabok at i like lucky me palabok kahit bitin so need to cook 5 packs to satisfy my cravings. ;-) love it!!! Free Treats for Moms by Precious MOMents! Ka Inato: Palawan's #1 chicken is now in Manila! Wrong Ramen: How can this wrong be so right?